If you want to grow your business, you need to engage in effective marketing activities which tap into the way people buy today. Most people now start their buying research with a web search and, in Australia, it’s more than likely a Google search. Not only do you need to attract these searchers, you need to provide them with something they want or need so you can convert them into leads. Once you’ve captured them as a lead, your inbound marketing software goes to work feeding them the information they need to close them as sales. Companies who have implemented inbound marketing strategies double the conversion rate of their website from 6% to 12%.This along with the fact that companies using the HubSpot software to manage their inbound marketing see their website traffic more than double. The maths is pretty simple, twice the conversion rate and more than double the traffic equates to over 4 times the number of leads being produced than for the average website. 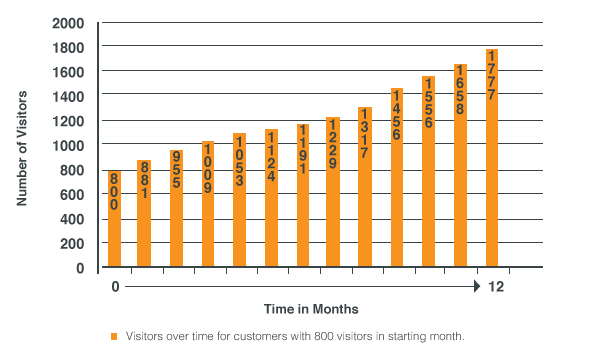 The image below shows the dramatic growth in website visitors when doing inbound marketing using the HubSpot software. A buyers behaviour is often fragmented. It often takes quite some time for a buy to take the journey from initial research to making that buying decision. Along the way they’re distracted by all the things going on in their business and their lives, they don’t step into your marketing funnel and take a linear path down to being your customer. Your inbound marketing strategy will allow for this by guiding them down your preferred path yet allowing them to jump around as they need to. It’s this flexibility in your inbound marketing that allows your to stay in touch with your leads right through their buying journey and ensures you’re there right at the end, when they make their buying decision, that delivers the results. Companies with aggressive growth goals don’t have time to waste calling a list that converts at less than 2%. Inbound marketing provides both the results and return on investment you need to grow your business. Is inbound marketing right for you and your business? We've created a free eBook which describes everything you need to know to decide that inbound marketing is right for you.